Posted 5/29/2010 9:09pm by OONA COY & BEN JAMES. Posted 5/26/2010 8:42pm by OONA COY & BEN JAMES. There's been a dry spell of newsletters and rain. With all this super warm May weather, irrigation needs and weeds and transplanting schedules have been sped up and time for writing has been pushed to the late evening hours. As you can probably tell from the emails you've gotten about the Tuesday Market, we've been living our lives half as market managers and half as farmers and half as parents. It's a lot of halves. We're happy to say that next week will be the first week of pickups for the season. We'll have beautiful head lettuce, arugula, tur nips, radishes, broccoli raab, chard, scallions and spinach, so get ready to eat your greens. And maybe some other surprises. We will send out another email reminding shareholders which day is your pickup day with a few guidelines about visiting our farm. We will also have items in our farm store for sale next week. Ben will be making shaved ices for $1 apiece (1/2 the market price). Thanks to all of you that have come to the Tuesday Market already – it's so nice to see familiar faces and meet new shareholders. In the world of the USDA, beginning farmers are those that have been farming for under 10 years, which we've been totally understanding this spring as we continue to set up and revise and recreate our farm systems. We now have four fields in four different locations with all kinds of different micro-climates and irrigation systems to construct – luckily, they're all within ½ mile of the farm and Ben is, by his nature, a problem solver. Our fields are affectionately called by the first names of the owners or previous owners (Ed's, Jim's, Maria's, and Lorraine's). If you'd like to take a driving, biking or walking tour sometime, we can direct you to most of them. At Lorraine's, we have a well that we can pretty easily irrigate from. For the others we have to fill up a 1000 gallon tank on the trailer behind the tractor along with a portable pump and let the water flow through our lines of drip irrigation tape for hours. The modern drip irrigation technology was developed by an Israeli as a way to efficiently bring water to the desert – here's a short wikipedia history of drip irrigation. The only downside is all the plastic it involves. Water is what we're all thinking about right now – drinking enough to not get dehydrated in the fields, swimming occasionally to wash off the sweat and dirt, giving enough to the plants in the greenhouse and out in the fields and the animals so that they can grow. Hot, dry weather always makes me think about parts of the world where water is extremely precious and people walk all day to get it for their families. It flows out of our tap here and our kids play with it in the sinks and bathtubs and sprinklers. And it's still very possible that come July, we'll be overwhelmed with thunderstorms and asking for just a little break to control the weeds and fungus. Our four-year-old Silas is really starting to feel a sense of ownership in the farm this year. We're looking forward to the moment when contributing to work catches up with that feeling, but, for now, we're amazed by how much he's tracking everything that's going on. Over the weekend, a neighbo r was helping with some tractor work and came by to ask if he could till in the cover crop of rye a second time over at "the field by the airport." Silas chimed right in and said, "That's Jim Demos' field." He's also been very excited about the all the baby animals around – goat kids, chicks, turkey poults, ducklings (more about these another time). Wiley, now 6 months, spends most of his time tracking his big brother and putting things in his mouth. This morning, while I watered the greenhouse, he was sitting in a sea of clover slobbering on leaves and flowers. We, at last, have a full crew working out in the fields. David DiLorenzo started in early May after graduating from Umass, and Ari Baum-Hommes started this week after finishing up at Mt. Holyoke. Ari worked with us for about a month a couple of years ago when we had 15 shareholders and we were just about to start the Tuesday Market, so it's a measure of how much our farm has changed to have her back again. Weeding a row of anything or transplanting anything just seems to go faster when there are three or four people chatting, singing, and working together. We're lucky to have them all here. Here's a recipe for our new favorite thirst quenching natural gatorade for you to try – some local ingredients, some not. 1 pint water, 1 tablespoon maple syrup, juice of half a lemon, a pinch of salt. Yum. Posted 4/18/2010 4:22pm by OONA COY & BEN JAMES. Greetings from the farm. If you're wondering how we can find time to write to you when we should be planting your vegetables, well, you're right. There's no time at all! What with ground preparation, setting up new equipment, catching goat babies, planting perennials, managing the greenhouse, and getting Tuesday Market up & running, there just isn't an extra minute. As the soil warms, it's a constant race to keep seedlings moving out of the greenhouse so that we have the room to plant more in their place. We have happily sold all of our shares for the season. We look forward to seeing familiar faces and meeting the new shareholders in early June. We're extra-especially excited about new folks that live ri ght in the neighborhood, as well as some old friends of ours that are becoming part of the farm (if you're a farmer, the only way to reliably see your friends during the summer is to coax them to your farm with fresh vegetables). April has been a whirlwind of a month. Hot weather, cold weather, goat babies being born, lots of seeds getting planted in the greenhouse and out in the fields. So far we have planted lettuce, spinach, various members of the brassica family (this means arugula, asian greens, turnips), carrots, beets, fennel, chard, peas and more. This week it's all about onions & potatoes. We've also been planting a new round of perennials (strawberries, raspberries, asparagus), renting new land, learning how to use all the new & supposedly time-saving equipment that Ben bought this winter (a new mechanical seeder made in Korea, a sprayer rig built by an Amish farmer in Pennsylvania, an awesome Perfecta Harrow). And exciting news- this month our assistant grower Laura and our new worker Olivia expertly caught the triplet goat kids born on Thursday while Ben was out buying Oona a birthday cake. 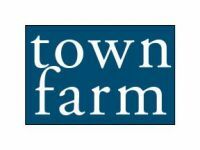 But the biggest news here on the farm is not goat babies or chard or anything like that -- it's that we finally have a real Town Farm website! If you're reading this on the site, well, Hello. There will continue to be more content as we have time – there's a whole recipe section and a crop readiness calendar that we haven't managed to set up yet. The whole thing's pretty cool, done through a company called Small Farm Central that makes user-friendly templates for farmers, to which we add our own formatting & content. We've also been gearing up for our first Tuesday Market of the season on May 4th. Hours this season are 1:30-6:30pm. It's located between Thornes Marketplace and the Parking Garage. Shareholders always receive a 10% discount at our stand. If you haven't been to the market, it's just great, with tons of kids and good music and fabulous food. A great place to stop on your way home from work. For the first market, we'll be there with some goat babies. We also just made a Tuesday Market website, and we'll soon have a facebook page where you can get updates on the weekly musicians and events. We're excited to be accepting food stamps and WIC and senior coupons at the market for the first time this year! Please spread the word. It's taken a good bit of time and energy to make the food stamp thing happen. Now we need people to use their benefits at the market to make it worth it all around. Posted 1/29/2010 1:40pm by OONA COY & BEN JAMES. Winter greetings from the farm. We’ve had a fantastically full month of planning around here, doing everything from completing our seed order and mapping our crop rotations to hiring new workers and making plans for our farm store (more about this in a minute). January was especially productive thanks to Laura Dinwiddie, our returning worker who will be assistant managing the farm this season. We’ve actually been a team of four: Oona, me, Laura, and then there’s baby Wiley providing all sorts of input in the form of spit-up and distracting smiles. Who knew there was such a thing as a calm baby? This was not something that Silas (our almost-four-year-old) prepared us for. 2010 will be an eventful year for us, not least because we are implementing a bunch of new systems for planning, planting, cultivating, and even storing our crops. We’re buying a bed shaper and a couple other new implements, and we’re building a walk-in cooler to be able to cool your produce immediately, so that it will stay fresh as long as possible in your kitchens. We’re also putting up a real web-site where you’ll be able to read weekly updates and find recipes and such. On the less technological front, we’ve been doing a lot of talking about the “CSA experience” and what more the farm can offer to shareholders on a weekly basis. We’ll be putting more effort into planting and maintaining pick-your-own crops, making sure that most weeks have at least one food or herb crop for you to harvest yourself. Having a three-year-old makes me see a lot of the world through a small, energetic, wondrous person’s eyes (feel free to exchange the words “small,” “energetic,” and “wondrous,” for “crazy,” “crazy,” and “really crazy”). 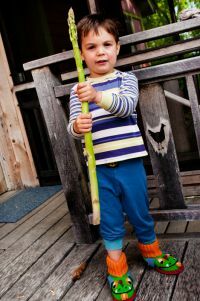 One of the things I love about our CSA is how many awesomely weird kids show up at the farm every week. This spring we’re planning to get some of our goat kids close to the CSA barn on pick-up days for general interaction and enjoyment. In the summer your (human) kids – and even you – can look forward to hand-cranked shaved ice/snow cones on a somewhat regular basis. I’m also aiming to expand the playground a bit if time allows this spring. We’ll see. So, here’s wishing you a great end of winter and early spring. We’ll send out an update or two in the next few months. Pick-ups start the beginning of June, but we’ll be at Tuesday Market starting in May, so feel free to get some early greens, etc. from us there with your 10% discount. We have some shares still available for this season. If you have any friends looking for a farm to join, please let them know. So take care, and please go on and fill out that store survey as soon as you can (like now, for instance). We’ll be seeing you.